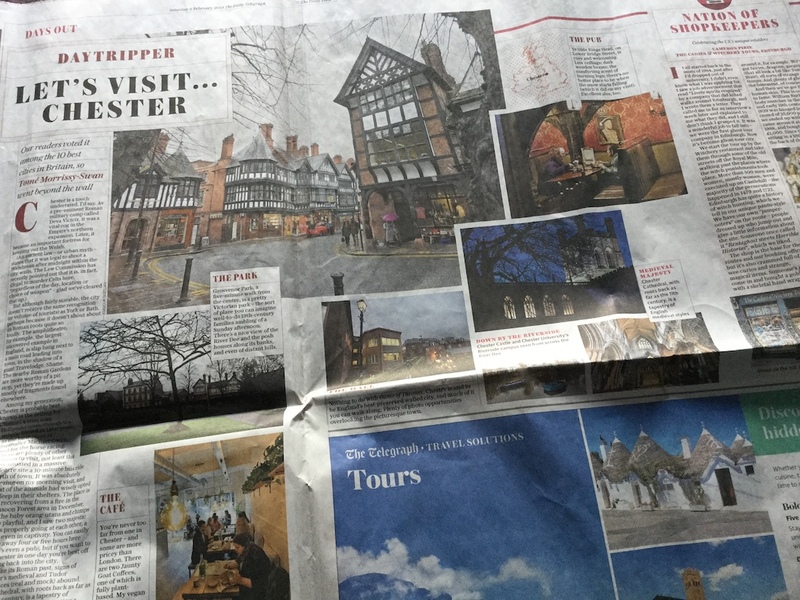 Did you read the Daytripper feature in the Telegraph this weekend [pictured above]? I read it and couldn’t help wondering if the writer had actually spoken to anyone who lives in, or even knows Chester at all? It’s sad to see the same tired, old clichés trotted out like a flagging mare at Chester Races. Especially when Chester was recently voted one of Britain’s ten favourite cities by Telegraph readers — ahead of Lincoln and Oxford. There’s a zoo — well, who knew? And there’s a hilarious anecdote about shooting a Welshmen within the city walls. Hold the front page. It seemed to me that this article completely missed the real story in Chester right now. There was nothing about the rise of the Chester indies, the high number of independent business owners now bringing new choice and variety to eating, drinking and shopping around the city. No reference either to the revitalised Chester Market with its Friday-night foodie events. Nor to the work that local MP Chris Matheson and creative community project GFN Chester have done to launch the Hunger Games promotion this week to champion local eateries. There was also nothing about Storyhouse and its work to bring the Woman of the World festival to Chester this April. In fact, there was no reference to Storyhouse at all. Surely anyone walking round the city with their eyes open would find it hard to miss the erstwhile Art Deco cinema converted into our new arts centre-library. This was, at best, ill informed and lacking in proper research. I’m tired of writers coming from London, casting a withering eye over the city and clearing off again having added nothing to the conversation. Especially as I know how much hard work goes on behind the scenes to #makechester. From individuals ploughing their heart and soul into a local business like Meltdown or Covino (amongst many others) to publications like Tortoise and Amble speaking up for non-chain Chester, this is a radically different place to the city l left in the Nineties to go to university. I’ve already tweeted the writer with some suggestions for what he should have done on his visit. Liked this? Try also Guest bogs for the Chester Growth Partnership.